TOKYO — The auto industry does not know just how bad it will be, but the repercussions from Kobe Steel's admission that it falsified some inspection data could sting automakers and suppliers around the world. Companies from Ford Motor to Toyota and Daimler went into the weekend asking just how exposed they might be to a scandal at Japan's third- largest steel supplier. Kobe revealed last week that it had falsified inspection data on some of the aluminum, steel and copper product that it supplied to about 500 companies in different industries. The big question: Will it lead to widespread auto recalls over metal parts that — even if they are not a clear safety danger — did not meet customer product specifications? Toyota, Honda, Nissan, Subaru and Mitsubishi Motors confirmed they made vehicles with sub-spec components supplied by Kobe Steel, while Mazda said last week it is investigating whether its vehicles were affected. The affected Kobe material also went into vehicles manufactured by Ford, General Motors, Tesla, Renault, Hyundai Motor, Daimler and Volvo Cars, various press reports said last week. 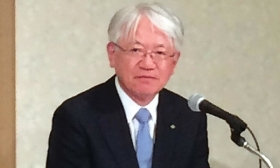 Kobe Steel CEO Hiroya Kawasaki said his company is working with automotive customers worldwide to determine the impact. Kawasaki said Kobe Steel will help cover the expense of any callbacks. The CEO said he is intent on resolving the quality lapses first and would consider resigning at a later point. "We haven't received specific recall amounts from our customers," Kawasaki said last week at a hastily called news conference here. "Of course, through consulting with our customers, we are intent on shouldering the costs they will incur." Kobe revealed that it had falsified data on metals used in products from automobiles to planes and trains, in some cases over the last 10 years. It said it is not aware of any resulting product failures. The suspect Kobe Steel products include flat-rolled aluminum and aluminum extrusions, copper strips and tubes as well as aluminum castings and forgings, the company said. The revelation is the latest in a series of compliance failures to hit Japan's automotive industry. Quality lapses at airbag supplier Takata resulted in more than a dozen deaths and triggered the biggest automotive recall in history — covering 42 million vehicles in the U.S. alone — before plunging the company into bankruptcy and a sell-off of its assets.